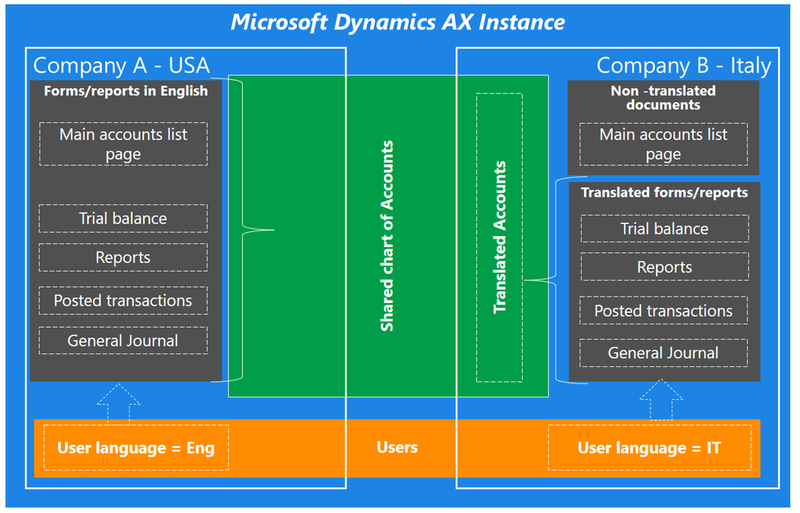 Enterprises may have subsidiaries in multi countries, in that scenario you can utilize the multi-language capabilities in Microsoft Dynamics AX. This enables translation of the client interface, including menus and data translation. In this blog post I will focus on translation of the shared chart of account functionality, this enables translation of the client interface, including menus and data translation. In my example a company has two subsidiaries, in one AX instance. The first legal entity is in the USA and the second in Italy. The chart of accounts is identical across legal entities, and each legal entity is required to have the chart of account in their own language. In a real life scenario, you must also consider specific regulations from each country that relate to a chart of accounts. The shared chart of account language is English. 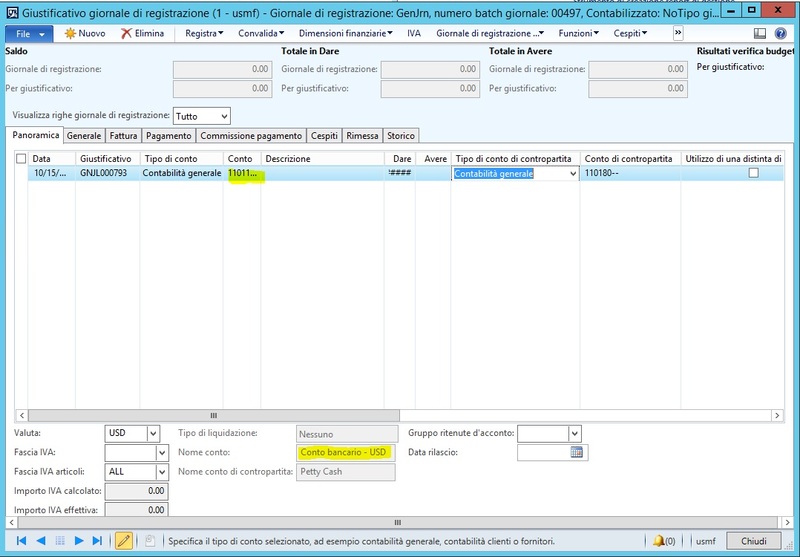 Secondly, use the translation functionality in the chart of accounts. The below diagram illustrate the basic concept of the shared chart of accounts, the use of translation functionality, and user language. I would consider numbering the steps going forward so they are easier to follow. 5. In the Text translation form, select the language and add the translation text. 7. Changing the user options will result in menus being translated to Italian. To see this change, go to General Ledger| Journals| General journal. Create and post a general journal entry from the Italian interface. Note the account name shows in Italian. 8. The posted transaction details are shown in Italian as demonstrated below. 10. The below example demonstrates the multi-language functionality with the Trial Balance list page. 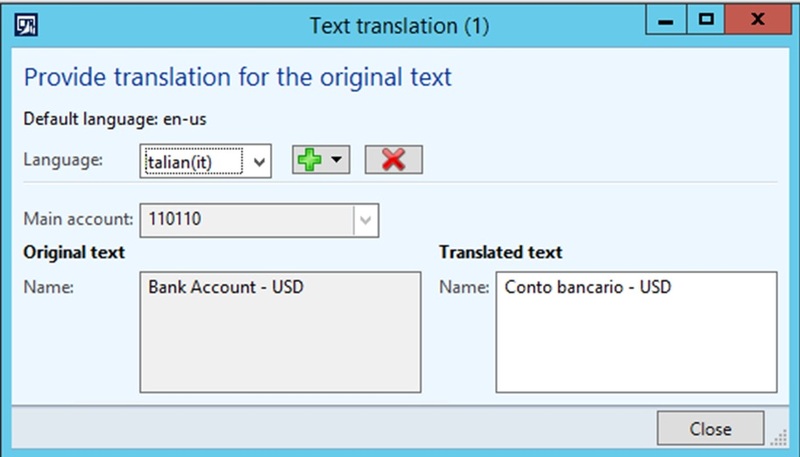 You also can use this form to create translated text for a main account name and a custom financial dimension value. The translations that you create are displayed everywhere that a main account name or custom financial dimension value is displayed, except on the main account list and list pages.